There are thousands of different Thai dishes, and only perhaps a few of them are considered Thai breakfast only dishes, meaning exclusively available in the morning for breakfast. Instead, in Thailand you can pretty much eat the same foods for breakfast as you might eat for lunch or for dinner. In Thailand the distinction of what is eaten for a specific meal, is much less set in stone, than it is, in for example, some of the western world where one might think of eating bread or cereal for breakfast. One of the things I love so much about Thailand is that I can go to the market early in the morning and eat a delicious breakfast of just about anything I want, from little snacks, all the way to Thai stir fried chicken with basil, grilled chicken, or even rice and curry (which is quite common to eat for breakfast). Anyway, all that being said, now I’m going to share some of the most popular things that many Thais love to eat in the morning for breakfast. In Thai, breakfast is known as ahaan chow (อาหารเช้า), meaning morning food. 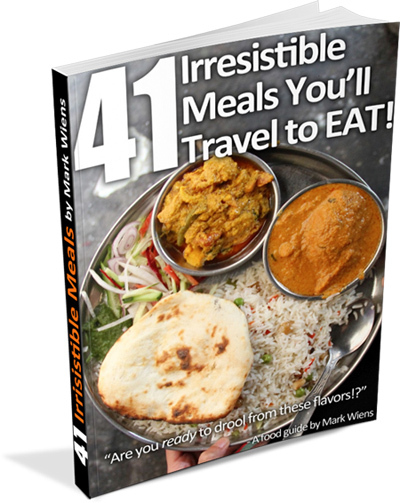 Bonus: Download your FREE copy of the “Bangkok $1 Menu” that includes 50 of the best single plate Thai dishes to eat! If there’s one food that immediately pops into my mind as a Thai breakfast dish, it’s the thick rice congee porridge known as joke (โจ๊ก). Joke (โจ๊ก) is very similar to the Chinese style of congee, rice boiled until it dissolves, and forms a thick porridge that’s almost the consistency of instant oatmeal. It is served piping hot, usually with an egg cracked in the middle, some pieces of minced pork made into meatballs, sometimes a few pieces of liver, and finally garnished with thin slices of ginger and cilantro. When I eat joke (โจ๊ก), I like to then load it up with black pepper and squirt in a few drops of sauce Maggi. 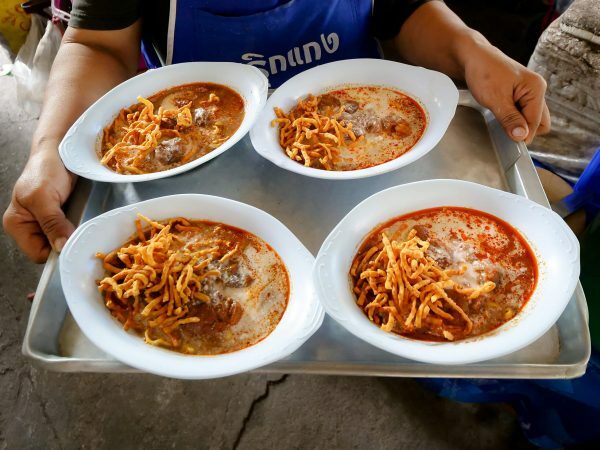 Perhaps if there’s one morning meal in Thailand that would be the rough equivalent of a Western style bowl of cornflakes and milk, joke (โจ๊ก) would be it, a classic dish that everyone enjoys in the morning from time to time, if not frequently. Khao tom (ข้าวต้ม) is sort of like the cousin of joke (โจ๊ก), but instead of the rice being dissolved into a porridge, khao tom (ข้าวต้ม) includes rice that’s cooked on its own first, then cooked into a soup with other ingredients and broth. 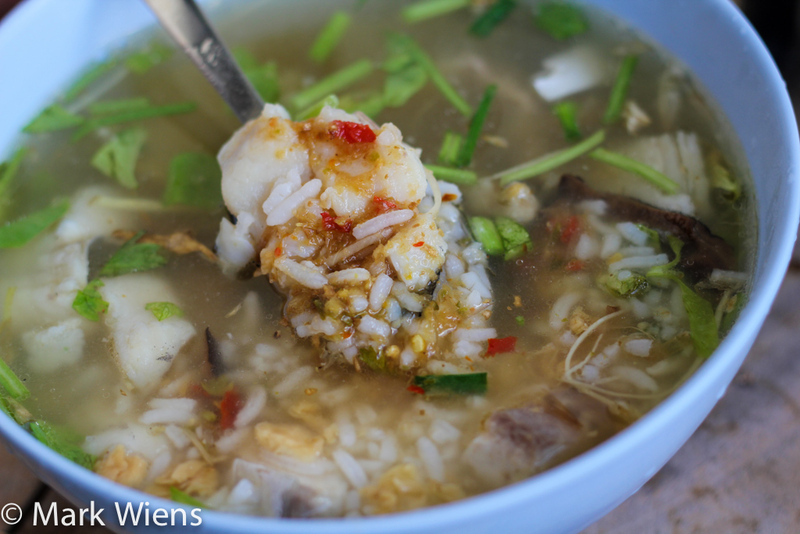 Unlike a smooth congee porridge, khao tom is much more coarse, and you can still see each grain of rice. You’ll find a number of different types of khao tom (ข้าวต้ม) in Bangkok and throughout Thailand, but it’s often eaten with a mix of seafood or with fish, and a few small vegetables like Chinese celery. Another style of eating khao tom (ข้าวต้ม) in Thailand is to just get a plain bowl of rice soup, and eat it along with a variety of stir fried dishes. Khao tom (ข้าวต้ม) is not only available for breakfast, but it’s very common also to eat for dinner, or for a late night meal. 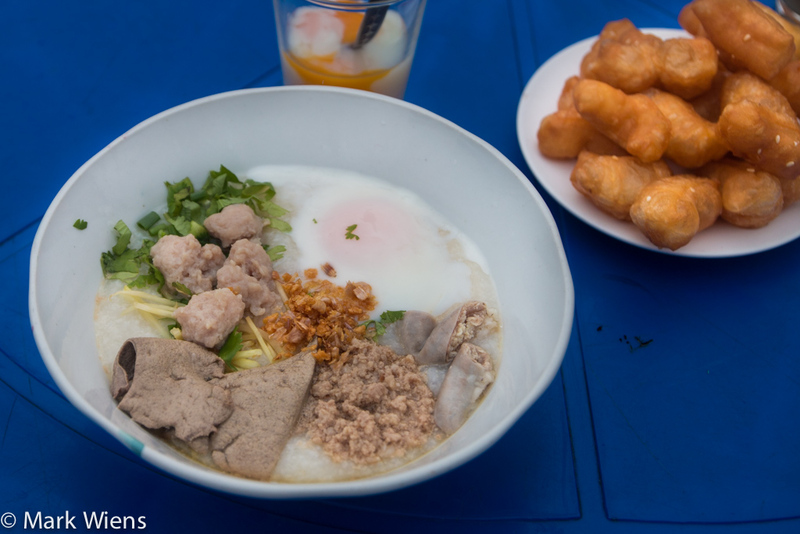 One of the local Thai breakfast favorites, and this is one of the dishes on this list that’s most commonly known as a breakfast dish, is tom luad moo (ต้มเลือดหมู). It basically translates to boiled pork blood, so you can imagine it’s quite a meat protein option to eat in the morning. The soup is a combination of different pork parts, often intestines, liver, lungs, and then the necessary chunks of coagulated pig’s blood that live up to its name. The soup is quite plain, mostly pork flavored, and you can then add in as much chili or vinegar as you’d like to enhance the flavor. Tom luad moo is usually eaten with a bowl of rice on the side. Along with Thai style rice congee soup (joke), one of the most popular things you’ll see eaten for breakfast in Thailand is khao kai jeow, meaning just rice and an omelet. Sometimes there are street food carts set up for exclusive omelet making, and there are a variety of ingredients that you can choose from, often including minced pork, onions, and a selection of other small vegetable ingredients. Once you make your selection, they will fry a fresh omelet, put it over the top of a bed of rice, and serve it to you with some ketchup tasting chili sauce on the side. You can also usually order a khao kai jeow at any Thai stir fry restaurant in the morning. If you want to make your own Thai style omelet, check out my recipe here. If joke (โจ๊ก) is the cereal of Thai breakfast foods, khao neow moo ping (ข้าวเหนียวหมูปิ้ง) would have to be the sausage, egg, and cheese biscuit. 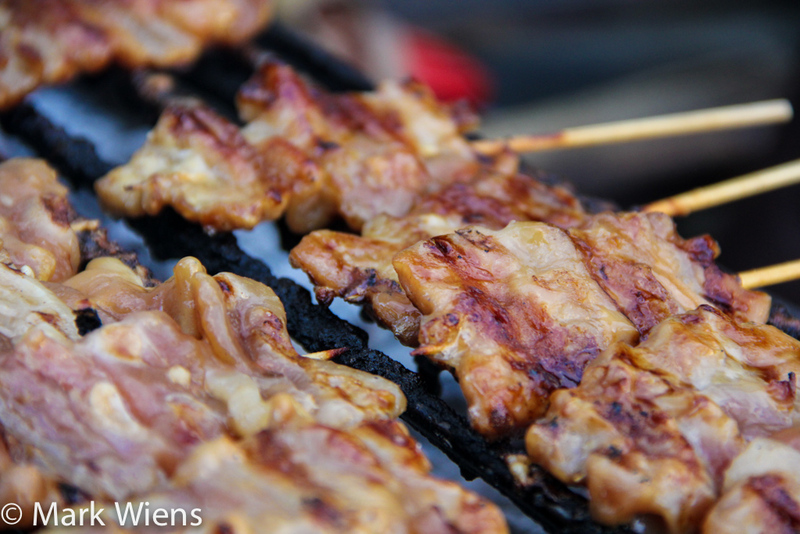 Moo ping (หมูปิ้ง) are little skewers of grilled pork that you’ll literally see everywhere you look in Thailand. In Bangkok, they are available mostly for pushcart street food stalls, and are served just about 24 hours a day. A few skewers of grilled pork (หมูปิ้ง) combined with sticky rice, which normally will come packed into a little plastic bag (ข้าวเหนียว), makes the joint combination of khao neow moo ping (ข้าวเหนียวหมูปิ้ง), a Thai staple. In every morning market, and along sidewalks in busy areas of town, you’ll find khao neow moo ping (ข้าวเหนียวหมูปิ้ง) frequently. The pork is nice and tasty, and goes extremely well with the sticky consistency of the rice. You’ve always dreamed about eating hot and fresh grilled chicken for breakfast, haven’t you? I sure did before I moved to Thailand. The good news is, it’s not only available to eat grilled chicken in the early morning, it’s quite a popular thing to eat for breakfast in Thailand. 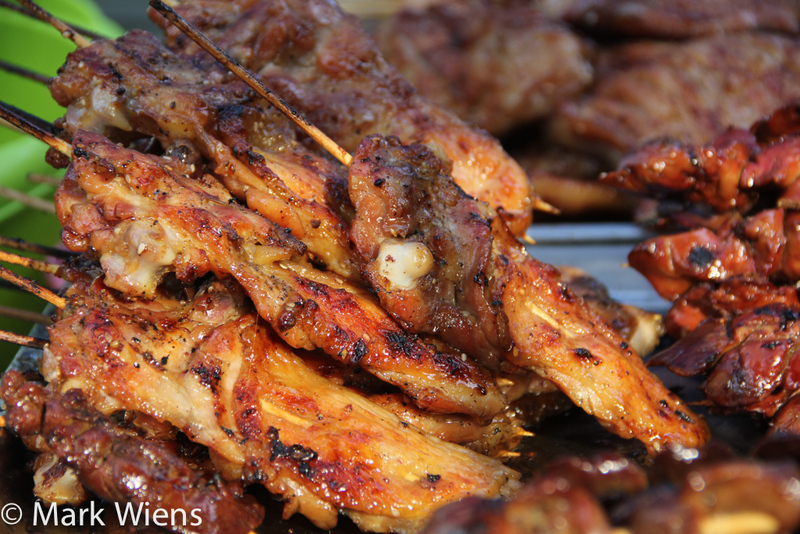 Grilled chicken is usually eaten along with a bag of sticky rice. Patongo (ปาท่องโก๋) is the Thai version of the donut, a blob of lightly sweet dough deep fried until it is fluffy on the inside and crunchy on the outside. 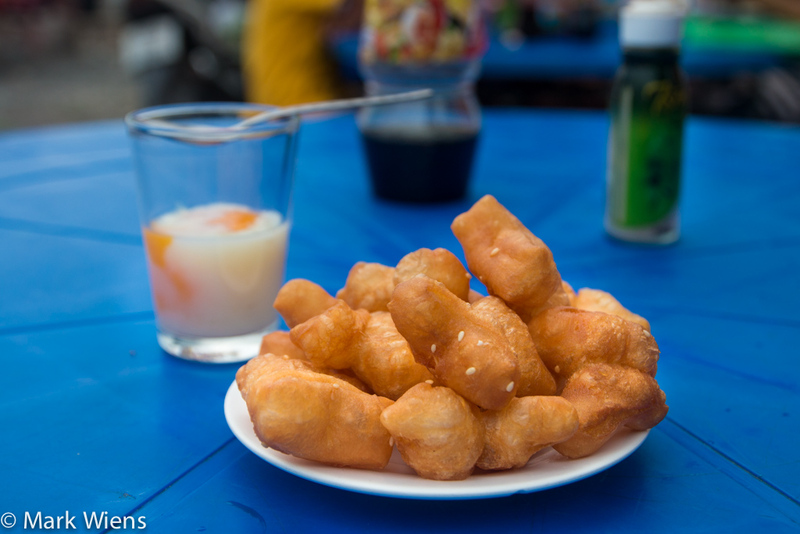 In reality, Thai patongo is basically the same as Chinese donuts, or yao tiew. In Thailand, whenever you see a huge wok full of oil, and a vendor turning pieces of dough with a chopstick, you know there’s patongo (ปาท่องโก๋) available. The dough is light and fluffy, and instead of a sweet style donut, they are salty instead. Patongo (ปาท่องโก๋) is one of the most common breakfast snacks in Thailand, and many people will buy a bag to takeaway for breakfast. They can be eaten as is with a cup of coffee, dipped into a sweet custard known as sang kaya (), or it’s also common to dip it into a bowl of joke (โจ๊ก). Often served at the same street food stalls as patongo (ปาท่องโก๋) donuts, nam tao hoo (นำ้เต้าหู้) is the Thai version of fresh soy milk. 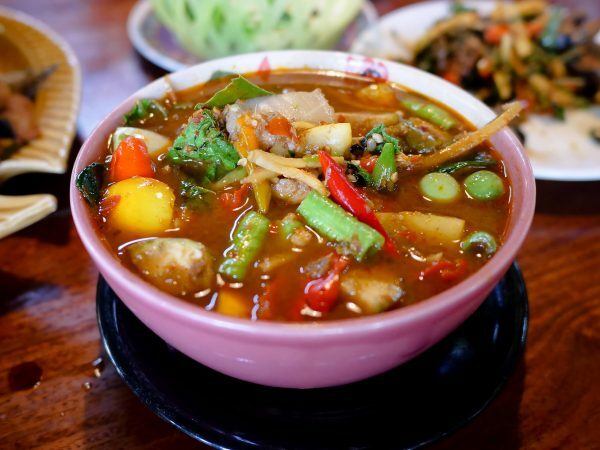 Rather than being served like a beverage, nam tao hoo (นำ้เต้าหู้) is served more like a soup. If you order it on the streets, they’ll add in some sugar, and a choice of small jelly ingredients or basil seeds if you like, then package the hot soy milk into a plastic bag. Nam tao hoo (นำ้เต้าหู้) makes a light Thai breakfast, but I can guarantee that it’s very soothing. It’s also popular to have nam tao hoo in the evening or at night after a meal. In addition to nam tao hoo (นำ้เต้าหู้), many vendors will also sell nam king (น้ำขิง), or ginger soup, which I personally love even better (though nam king would be more of a night snack / dessert). 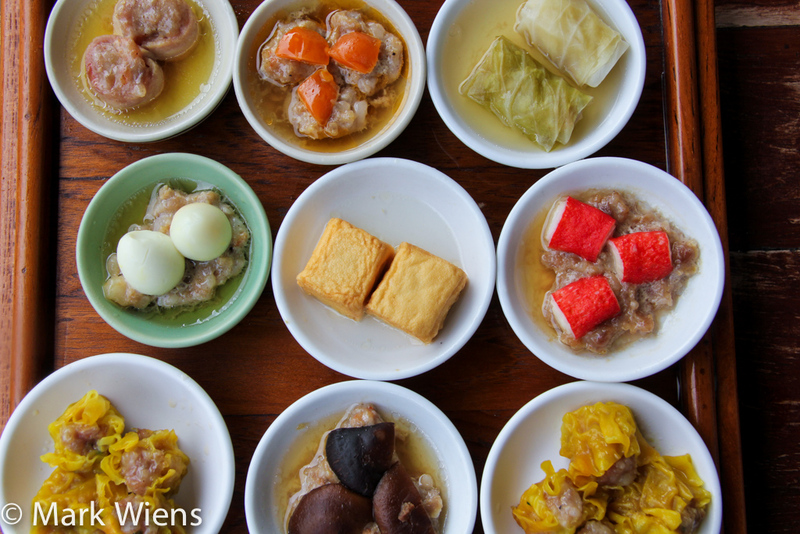 Adapted into the Thai culinary scene from the Chinese, various forms of dim sum are popular to eat for breakfast in Thailand as well. Normally vendors just sell a few items like steamed buns (salapao) and rather greasy pork dumplings (shumai), but some restaurant throughout the country have more items to choose from. I’m personally not a huge fan of Thai dim sum, it’s not exactly the Hong Kong dim sum or Honolulu dim sum dining experience. 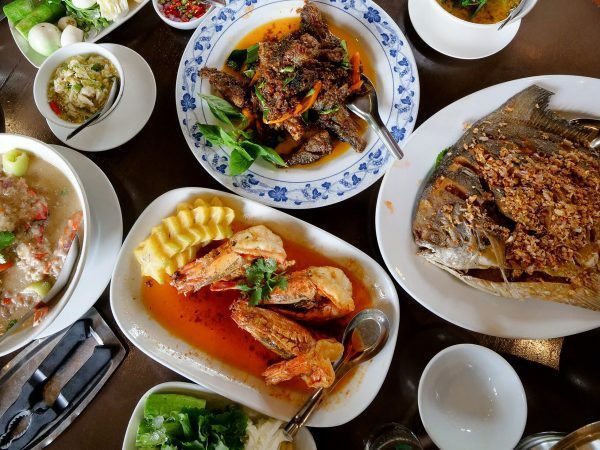 But that being said, if you’re up for an interesting dim sum meal, and like to get some serious protein in the morning, you might try to locate a Thai dim sum restaurant in the morning. If you happen to be in Krabi, be sure to check out this place for breakfast. When I was in China I was devouring steamed baozi filled with a choice of ingredients by the bag full each morning. In Thailand, the baozi, which are referred to as salapao (ซาลาเปา), are a bit different, usually smaller and often the choice of filling is limited to red barbecued pork, minced pork, sweet red beans or cream. Honestly, in my opinion, they just can’t live up to the version of steamed buns in China, but nevertheless they are quite popular to eat for breakfast in Thailand. You’ll find street food carts selling salapao (ซาลาเปา) throughout Thailand. 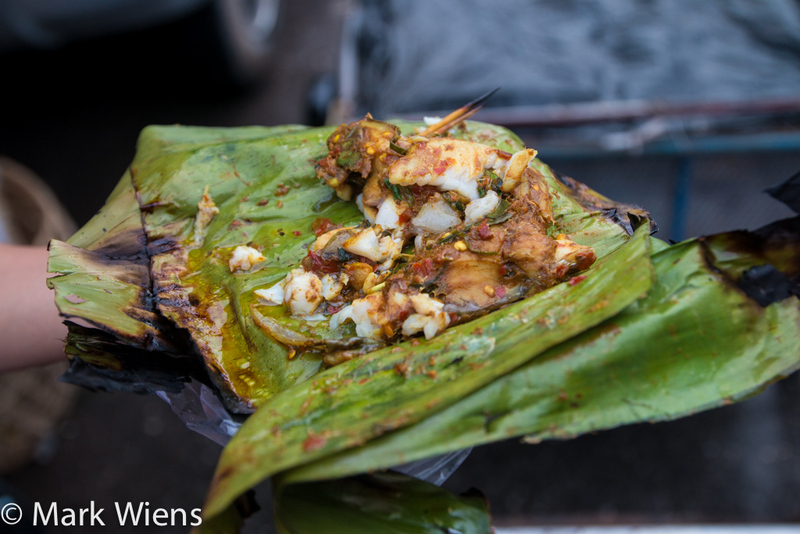 One of my wife’s favorite things to eat in the morning in Thailand is khao neow sang kaya (ข้าวเหนียวสังขยา), or sticky rice topped with a slice of custard, and wrapped in a banana leaf package. You can find both black sticky rice and white sticky rice, which is similar to the sticky rice used in mango sticky rice; It’s cooked in coconut cream and slightly sweet. But instead of mango, a slice of Thai custard is placed on top of a ball of sticky rice, which is drizzled in fresh coconut cream. For a popular Thai sweet snack for breakfast, khao neow sang kaya (ข้าวเหนียวสังขยา) is a great choice. 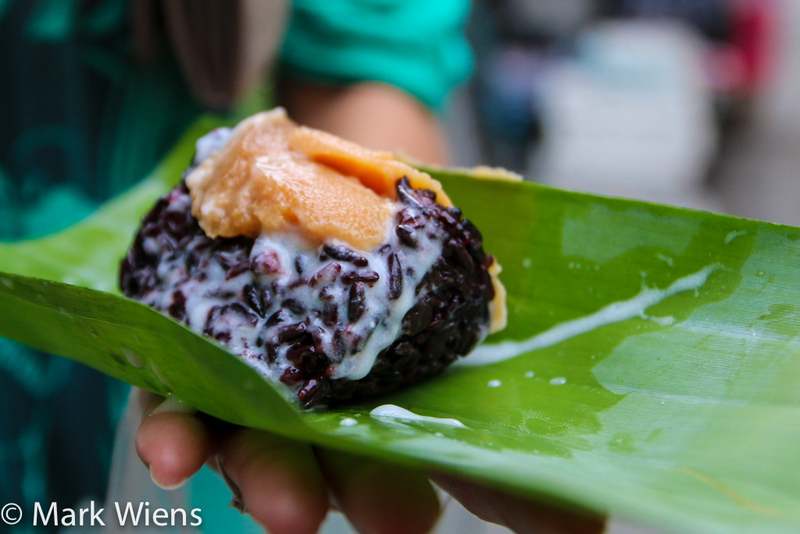 For perhaps one of the best versions of Thai black sticky rice with custard, go to the morning market on Silom Soi 20. At the front of the street, you’ll find a lady selling a delicious version of it, served only for takeaway. There’s always a crowd of people waiting to buy. Believe it or not, a few slices of white bread spread with butter is a very common form of Thai breakfast, mostly, I would say, with modernized business employees in Bangkok. 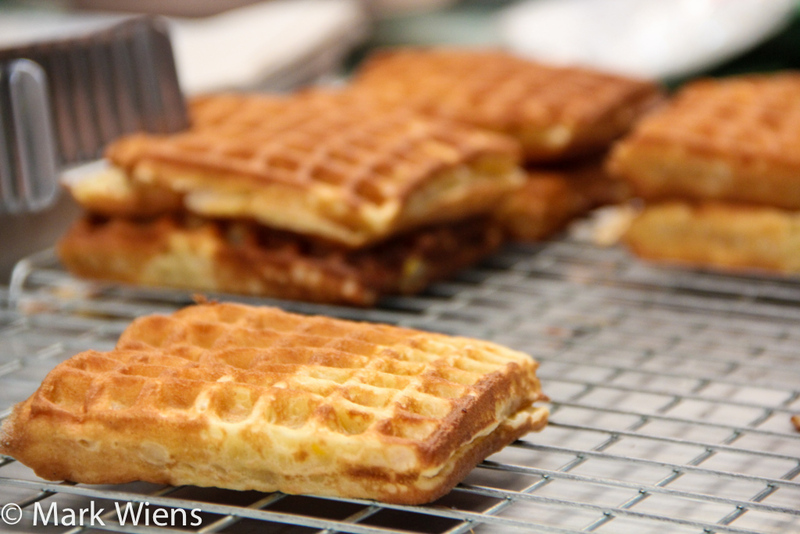 If you walk around the Bangkok business districts in the morning, around Silom or Sathorn, there are lots and lots of little snacks like sweet waffles and little baked goods that are popular to eat as breakfast. Many people will order a few bread or pancake based breakfast snacks to eat while on the go. There’s a term in Thai known as “khanom (ขนมห),” which roughly translates to snacks. 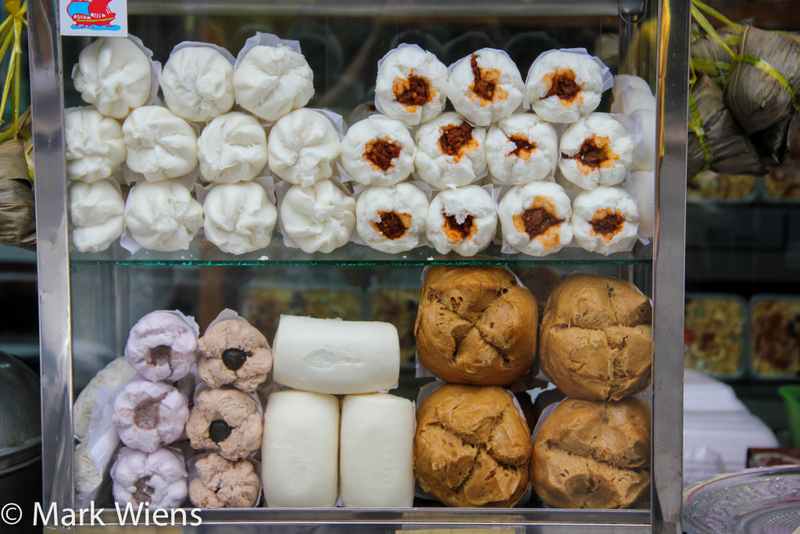 Khanom wan (ขนมหวาน) would be sweet snacks, and then just khanom would be any kind of snack you can find on the streets. Go to any morning market across Thailand, and you’ll not only find plenty of full meals to eat, but you’ll find a smorgasbord of Thai snacks, ranging from fried bananas to coconut griddle cakes. Many Thais who are looking for a lighter breakfast option, or who don’t have too much time, will just grab a few bags of khanom, and continue on their way to work or business. I’m personally not a huge fan of khanom’s, as I like to eat a full meat filled breakfast, but my wife (who is Thai), is a huge fan of snacking in the morning. 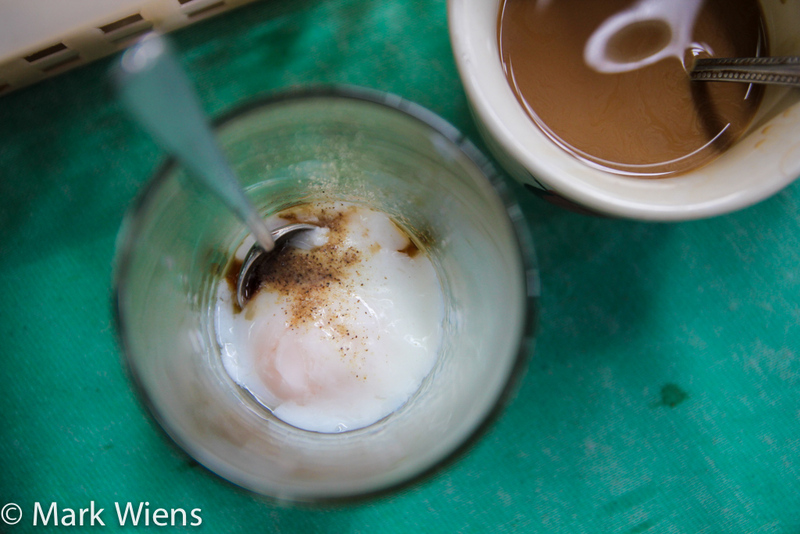 When you think of eggs for breakfast you might think of an omelet or fried eggs, but one of the most popular ways of eating eggs in the morning in Thailand is in a shot glass, soft boiled, known as kai luak (ไข่ลวก). Soft boiled eggs in Thailand (ไข่ลวก) are normally available at street food stalls and restaurants that specialize in breakfast and that serve tea and coffee. I like to take my double shot of soft boiled eggs, season them up with a splash of Maggi seasoning sauce and a dash of pepper, and gulp it down. It’s an amazing quick protein and delicious snack. Kai luak (ไข่ลวก) also goes extremely well with the patongo donuts. Though kai luak (ไข่ลวก) is enjoyed by both males and females, it’s sort of known as a manly breakfast, that’s mostly popular with working class men, like motorcycle and truck drivers, and market workers, who take a break from work to drink a few eggs and have coffee. I’m a huge fan of kai luak (ไข่ลวก). 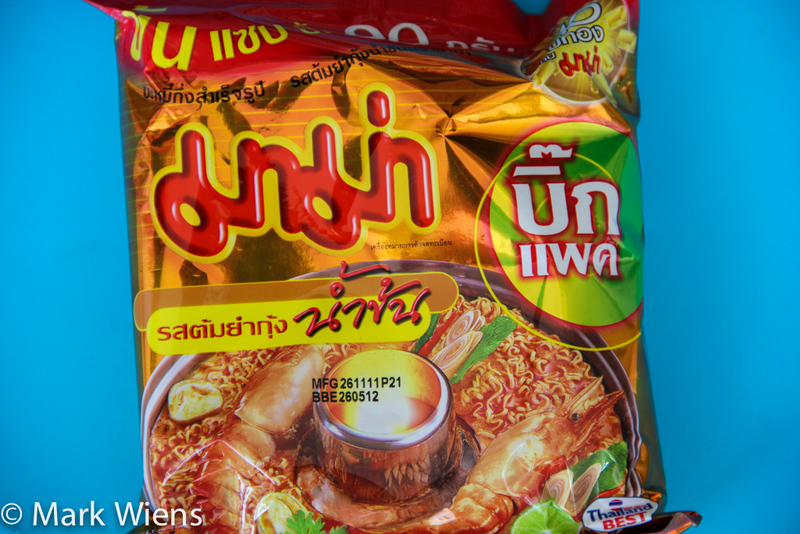 Thailand’s most famous instant noodles are popular at ALL times of the day and night… and they happen to make a pretty popular breakfast option as well. You can eat a bowl of cup of Mama instant noodles at home, or just pop into the nearest 7-Eleven for a quick paper bowl of noodles swimming in an addictive tom yum gong broth. It’s not my personal choice of breakfast (I go for rice and curry), but many choose to go the Mama instant noodle option, at least sometimes. Just like all of southeast Asia, Thailand is blessed with an abundance of high quality tropical fruit, and you’ll find fruit throughout the country. One of the most convenient things about Thailand is that wherever you go, you’ll find fruit all cut up and waiting to be consumed. Just choose whatever fruits you want, usually a choice of mango, guava, papaya, pineapple, watermelon, rose-apple, among others, and the vendor will slice it all up and package it into a bag for you. 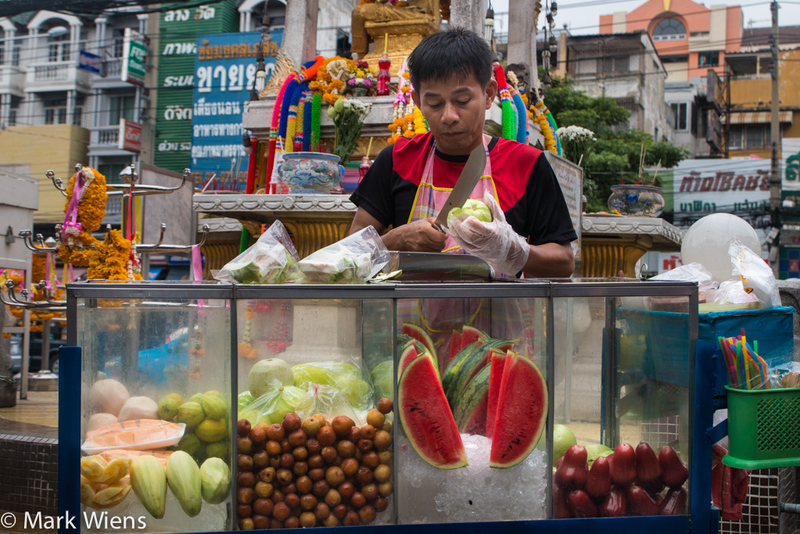 Freshly sliced up fruit is a very popular Thai breakfast, and snack throughout the day in Thailand. Now that we’ve covered many of the most common and typical to eat Thai breakfast dishes, there’s one more common meal that’s sort of like the Grand Slam of all morning meals: khao rad gaeng (ข้าวราดแกง), rice and curry. I’m a huge lover of Thai rice and curry, and in Thailand, rice and curry is the morning choice for many who are seeking a good sized filling meal. Starting from about 5 am, you’ll find curry vendors displaying their variety of curries available. Usually you get a plate of rice, and then choose whatever mix of curries you’d like on top, and it’s also often to get a fried egg on the side as well. Khao rad gaeng (ข้าวราดแกง) should be your breakfast choice in Thailand if you’re up for a spicy filling breakfast. If not, you can always eat Thai rice and curry for lunch or dinner. And also, I just wanted to mention two of my other favorite Thai breakfast dishes, which are rarely available in Bangkok, but one is common in the north and the other is common in the south. Unfortunately a dish called aeb pla is only available in the north of Thailand, and it’s quite difficult to find in Bangkok. But it happens to be one of my personal favorite types of early morning meals in Thailand. Aeb is a famous northern Thai food that’s a combination of meat, mixed with herbs and spices and curry paste, all wrapped into a banana leaf package, and roasted over fire. In Chiang Mai and Chiang Rai, you’ll find freshly grilled aeb in the morning markets, and along with sticky rice, it absolutely hits the spot – at least I sure think so. 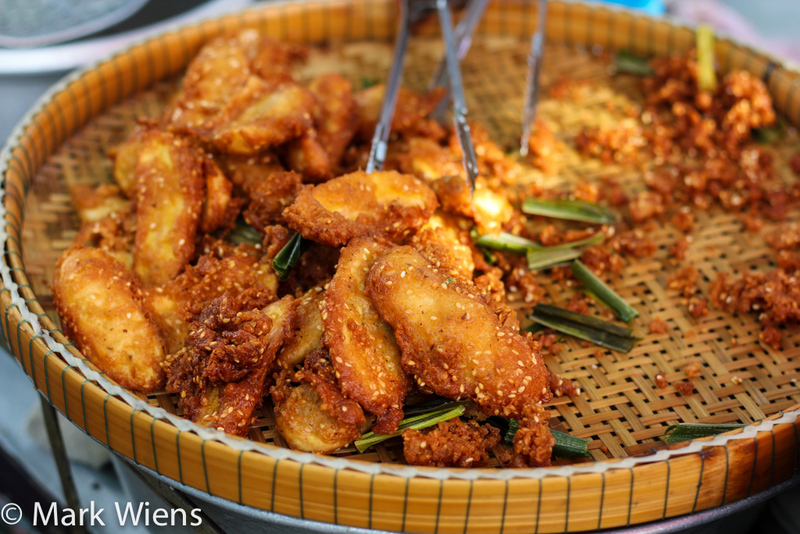 There are a few different kinds of aeb you can try, but my personal favorite is aeb pla nin, the version made with fillet pieces of tilapia fish. Khao yam (ข้าวยำ) is a southern Thai dish that means rice salad. It’s a combination of steamed rice, either topped, or mixed with, a garden of fresh herbs and vegetables that often includes bean sprouts, lemongrass, kaffir lime leaves, Chinese long beans, toasted coconut, chilies, and finally a tangy dressing. What I really love about eating khao yam (ข้าวยำ) for breakfast is that it’s quite a healthy dish, and it’s also not oily or heavy, so it feels great to eat in the morning. You can occasionally find khao yam (ข้าวยำ) in Bangkok, but not nearly to the extent that you’ll find it in the south of Thailand. I hope you enjoyed this article, and I hope it will assist you in choosing what to eat in the morning when you’re in Thailand. Overall, my top suggestion for you is to just wake up in the morning, walk around a local market, and see what looks good, and eat it! Also, be sure to grab your free copy of the Bangkok $1 Menu for more local Thai food. 89 comments. I'd love to hear from you! Wonderful article! Can’t wait to try these! Thank you! I have a 17 year old foreign exchange student from Thailand coming in two weeks for the school year. This is the least intimidating page I saw for what to fix for breakfast, definitely not what we’re used to eating (or cooking) May have to practice a little. Suzanne! We have just picked up our exchange student, a 15 year old girl from Thialand and it appears we are in the same boat! She lost her original host family placement so we are the last minute replacement and are scrambling! I agree with Suzanne, thank you for this helpful page! Ha ha, I used to go to Silom Soi 20 and eat the khao niaow sankaya every morning about 15 years ago! And at the other end of the soi was a guy selling fresh squeezed clementine juice dirt cheap. Those were my “fat” days. Awesome to hear that Willy! I love your food blog. Foreign food is no stranger to me as I eat “strange” on a daily basis at home, but having very little time to prepare for my first time trip to Thai I just looked up the first info I found re Thai breakfast and it was yours. And just kept in mind the idea of rice soup for morning meal although the idea of eating savoury soups in the morning has installed in my mind a good while ago (I am fan of Japanese and a healthy nutrition freak). And this helped me get trough safely on the first day, and then discover a delicious world of Thai soups; I indulged myself with aromatic Chinese celery as you described and all was like you’ve said. I only added boiled or fried fish to it. I am looking forward to taste other fantastic Samples next time I am there which will be soon. Meanwhile I am going to study your blog thoroughly. Regards, thanks and lots of “saludos” from Spain. Hello Kinda, very nice to hear from you, and thank you for reading this post. Glad you’re willing to try all sorts of food, and especially for breakfast. 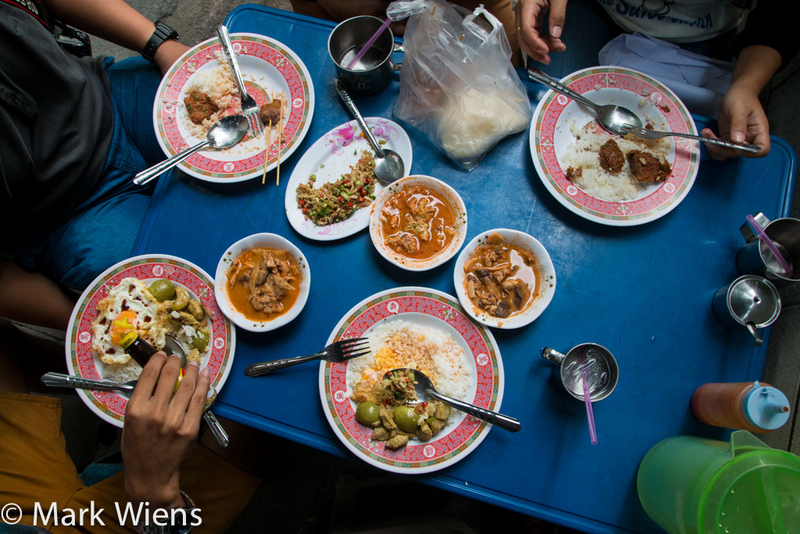 If you go out in the morning, you’ll find some of the best food in Thailand. Hope you have an amazing trip. I’ve thoroughly enjoyed the videos. The look of enjoyment on your face when you take a bite of something extremely delicious makes me smile. Will be in Bangkok later this year (as well as Chiang Mai). Will I be able to find Gai Pad Kee Mao with a street vendor or do I need to find a sit-down restaurant for that? We’re big fans of noodle dishes whether or not they are spicy. I also like Pad Prik or some type of spicy basil dish with pork or chicken. Hi Andrew, thank you very much. Most street food stalls that serve stir fried dishes will be able to make pad kee mao, also look to see if they have the wide flat rice noodles in their display cabinet – if they do – they should be able to make it for you. Enjoy! Actually Khanom(ขนม) is mean dessert. 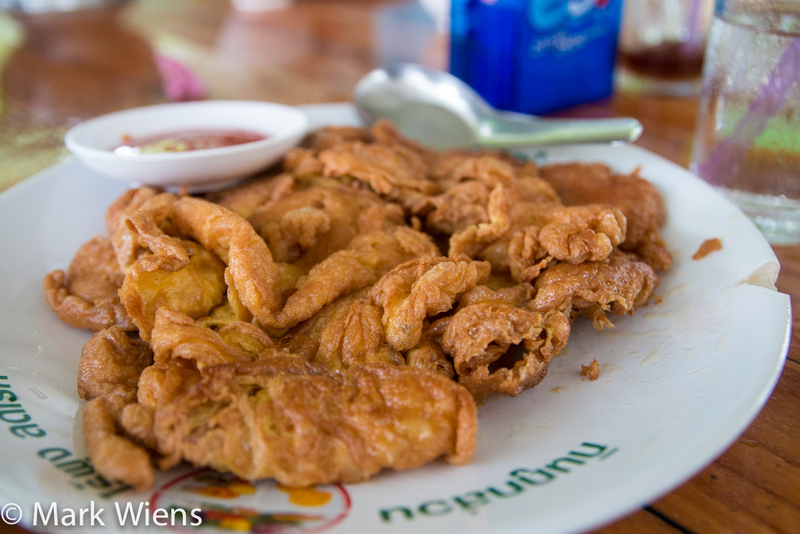 A deep fried banana is called Kluay Tod(กล้วยทอด). You acticle is really good and interesting. I like it. I’m trying to find a recipe for a dish that resembled a muffin with cream filling inside. It tasted like a pancake, looked like a muffin that was split in half, and had cream filling between the top and bottom. We bought them from a street vendor in Bangkok, and had to go back for more of them. There were two varieties, plain cream filled, and a corn cream filling. Any help? Hey Margaret, good to hear from you. Hmm, I can’t think of what that might be, it perhaps could have been a baked good that someone just made to sell. Do you remember where it was? My wife said it might be kanom mamon (ขนมมาม่อน) – might it be that? Came across you on you tube looking for Thai dishes. You taught me to refine my Thai cooking to taste more Thai. I am a Southerner from the panhandle of Florida. Saw you and Zimmern on an episode eating at your favorite restaurant. Congradulations on your success! Hi Ms. Jimi, thank you very much, happy to hear that you’re cooking Thai food. Thank you for your support, hope you’re doing well! Hi Mark ! Enjoyed your videos and blog. 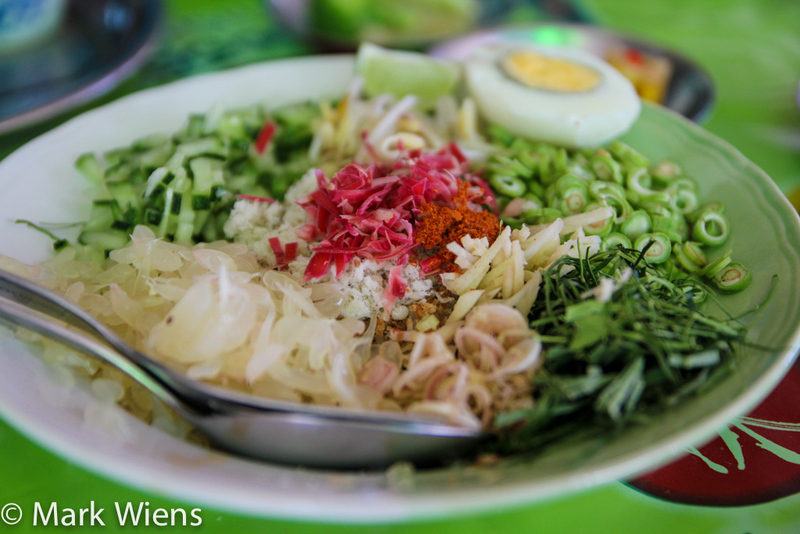 I was wondering if you can help me out on finding out which Khanom Jeen Restaurant I went back in 2007 in Krabi. You see, I had such a profound eating experience there that when I want to go back to it, I can’t seem to find it anymore ! :( It’s on the outskirts of Krabi and seems to be located in the woods(Literally) and the Khanom Jeen noodles were placed in small little rolls on a straw tray. The curries(there were a few) were in Clay Pots and you could choose which was your favorite instead of of just the Nam Ya type. Best bit was the Fried Chicken was just out of this world. Searching online let me to Ko Joi but the pictures were not of what I remembered about the place. Anyway, thanks again ! You are so amazing! I have eaten these breakfast without any attempt to categorize them for 48 years ha ha ha. I do enjoy reading your article since I really want to know what is ‘really’ Thai breakfast. Your category is flawless. It is so true; no one can denies. : ) In especial, your response to the post shown that you are ‘so in” and very Thai! Thank you so much for such a good job. Hi Nan, great to hear from you, thank you very much for reading this post, glad you enjoyed it! I’m just back from Thailand and missing all the delicious food.! It’s Sunday so I have to make breakfast. Thank you for article. I’ll come up with something???? You’re welcome, glad you enjoyed your time in Thailand! I’m jealous of anywhere that serves pork blood for breakfast!! I had what I think was Tom Luad Moo at a restaurant on Sunset once – it was quite good! Hey Xochitl, cool to hear you’ve had tom luad moo, good choice for breakfast! Hi Khaitoon, yah, I think a lot of our tastes grow and develop. How long have you been living in Toronto? Do you come back to Thailand often? Hi Mark, I love your youtube clips, actually the whole family enjoys watching them. I have watched near all of your info vids twice or more and never get sick of watching you devour all that great thai food,it makes my mouth water thinking about it. We are staying at Siam Square and wondering if you could give us any tips on where to get a good thai breakfast. Hi Paul, good to hear from you, thank you very much, and greetings to your family as well. If you’re up for some delicious rice and curry for breakfast, here’s a restaurant that’s not far from Siam: https://www.eatingthaifood.com/2014/04/sam-yan-market-rice-curry-nai-oo/ Have a great trip! This was so helpful! I’ll be in Thailand in a couple of days and the hotel that we’re booking in Chiang Mai offers the option to pay 220 baht extra per night to get an American breakfast in the morning. I’m definitely not going to Thailand to eat American breakfast! Keep in mind that most hotels that offer breakfast have a Thai breakfast. They run from simple to a pretty elaborate buffet, and for 220 baht extra I hope it’s the latter. They only highlight the American breakfast because that’s what they think the tourists want. Ask if you can check it out in the morning before committing. Sometimes it’s a way to get a nice variety of Thai foods. Hey Hannah, great to hear you’re going to be in Chiang Mai. Hope you have a great time, and good idea about breakfast – there are so many delicious Thai foods to eat in the morning. Enjoy! 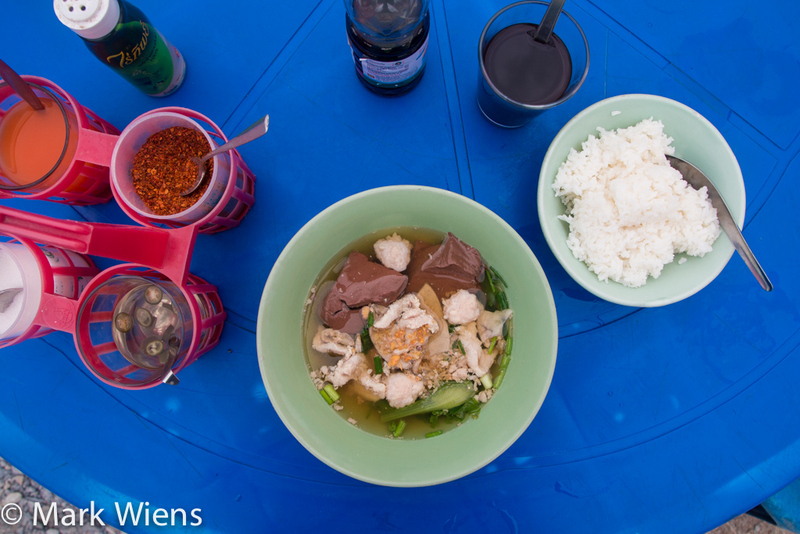 Great article, I’m a big fan of Khoa Tom Moo up here in Chiang Mai. Especially at the moment with cold mornings and hill mist. It’s the perfect start to the day. Hi Alex, thank you very much, khao tom is a great thing to eat in cooler weather. Khao tom is not just for the cool weather. My wife makes it quite often for the family, year round. She makes a lot, so I freeze the extra in single servings for a quick breakfast. When it’s been frozen, the rice absorbs the liquid and becomes more like jok. You may have to add a bit of a Knorr flavoring cube and hot water if you want it thinner. In addition to adding ground dried chili pepper (prig bpon พริกป่น), I like to add sesame oil. Gives it a bit of a Chinese flavor. Hey Tony, thank you very much for sharing, sounds delicious. I also like your idea about sesame oil, it’s such an enhancing fragrant flavor. I’ve recently become completely obsessed with your blog Mark, it’s fantastic. I’ve been to Bangkok several times on stopovers and it’s definitely one of my favourite places, but my next trip is just to Bangkok, just to eat. Which areas do you think are the best to find these sorts of breakfast foods? Hi Laura, great to hear from you, thank you very much for reading. It all depends on what area of town you’ll be staying in, but right in the heart of Bangkok you might try Silom Soi 20 – it’s a nice mid-sized morning market with lots of delicious things to eat. Hope you have a great upcoming trip. I read all your blogs and a huge fan, would you know a couple of places in Pratunam where we can enjoy Thai Street Breakfast? Hey Christopher, thank you very much. As for Pratunam, I’m not sure of any sit down places, but you’ll find plenty of these dishes along the road. 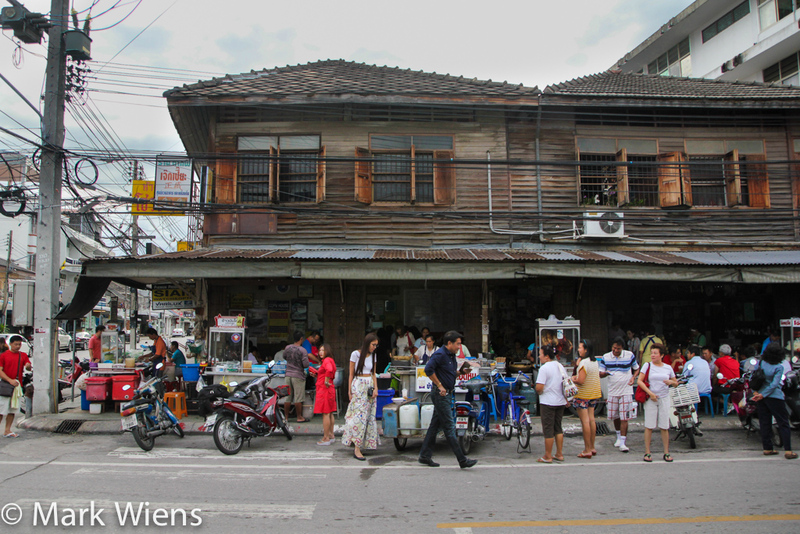 Also, not too far away is Petchaburi Soi 5 and across the street Petchaburi Soi 10, which are great for street food. Thanks for your revert and tips on breakfast close to Pratunam, planning a trip to Bangkok soon. Will definitely bring you some Sri Lankan Tea. It’s amazing how the breakfasts vary per region! In Phuket, we eat a lot of congee of khao tom and in Phuket Town there are loads of rice based sweets they make early morning. There used to be an amazing breakfast place we went to on a daily basis that had everything from friend squid in garlic to ramen ( which a poached egg and fish) and kai luak. I’m a giant fan of the simple yet so darn amazing way to serve omelettesKhao Kai jeow which is a fav of mine. Such great comfort food! Thanks for your extra input Elizabeth, and I agree, so many variations on what’s available and popular to eat throughout Thailand. Yes, it’s hard to beat a Thai style omelet over rice! Interesting article. You’ve about covered the bases. At home it’s khao tom for the family. My wife makes a big pot of it and I freeze the remainder in serving size containers. Pop it in the microwave for a quick breakfast and it becomes joke. One or twice a week I’ll pick up 3-4 sticks of khao neow moo ping or gai yang to eat at my desk. Occasionally my wife will pick up a bag of patongo and I like them dipped in maple syrup. The family loves French toast (kanompang yang) made with thick-sliced raisin bread I get at Yamasaki bakery in Khon Kaen. I add a little cinnamon and sugar mixture to the egg and milk to give it a different flavor. Of course, there is the standby of last night’s leftovers, whatever that may be. Also, my wife will make khao pad with the leftover rice and that also makes a quick and good breakfast. Lots of choices. There are a couple in your list that will go on my tryout list. Hi Tony, thanks for the comment and for sharing all your favorite Thai breakfast dishes. Good idea with the khao tom in the freezer, and great idea with dipping patongo in maple syrup too! Great article! You forgot to add one other common fare for breakfast, which is the fried pork and sticky rice. I see that a lot when I go to the office in the morning. There are two types: one is really crispy pork slices of mostly fat, and the other has leaner meat, bigger slices, and not as crispy but both types are super tasty. I am not sure what you call it in Thai. I also see different types of fried meat (usually in Ari and Victory Monument area) in the mornings where one can choose from a variety of meats, including fried liver, shredded pork (or beef?) meat that’s sweet, among other things. The vendor usually has these little styrofoam boxes filled with sticky rice that she tops with your meat of choice. I also see some fried chicken and fried liver and gizzards being sold in the mornings too. Could you do a fav by spelling out what we should buy & carry out to make Thai food a part of our life? Maybe some suggestions to learn about Thai food at any homely cookery class? Hey Raj, good idea, I’ll try to come up with something like that. I’m in Bangkok now and I’m loving your guide to the city! Do you know which district/streets are best for finding these breakfast foods? I easily found the Patongo and Khao Neow Moo Ping, but I would love to try the Joke or Khao Neow Dam Sang Kaya. Thanks for your help! Hey Michelle, thank you so much, and great to hear you’re in Bangkok now. Depending on what area of town you’re in, you might try Silom Soi 20 at about 7 or 8 am. Enjoy! Jerome, that’s a breakfast combo of champions! Hey Luke, I like khao tom too, especially with fish! Mark, that is a great list, but you missed my favourite Thai breakfast…mango & sticky rice! I had this for breakfast everyday on my last trip to Ching Mai. Hey James, haha, great to hear you had mango sticky rice for breakfast! That would make a great breakfast in Thailand! Funny, I spent 5 months in Thailand and only ever tried Joke, though cognee is pretty popular elsewhere in Asia too. Oh and of course I tried dragon fruit! Love the reference to “man power!” Things to, erm, “increase potency” are so popular in Southeast Asia! Haha, thanks Aaron – yes, you’ve got to eat a few “man power” dishes, especially for breakfast! Yes, congee is very similar to the Thai version of joke. I just point and go for it. Thanks for putting a name to the foods I have been eating for over a year now. Thanks for commenting Nola. The point-and-eat method works well too, but glad you now know a few names of some of these dishes! I’ve recently become a great lover of Thai food, having discovered the restaurant Pi-Tom´s in Toronto. It takes exactly two minutes to walk from my office to the restaurant. The tempting aroma of its food makes me enter the restaurant every single day. A few days ago, my Thai friend invited me and my husband for dinner. He served Patongo with some sort of custard. He dared us to guess what the name of the dish was. I looked at him and cried “Patongo!” Can you imagine his surprise? My husband and I could not do anything but laugh. This is an awesome story Lucy, thanks for sharing. I can imagine the surprise on his face! Glad to hear you are now such a fan of wonderful Thai food! I ate a lot of joke when I wasn’t feeling so well. It’s easy on the stomach. I have a bunch of 3 in 1 milk tea packets! It’s not as good as the real thing, but it’s better than nothing. Thanks Laura! Joke really is easy on the stomach and with a few condiments it can be quite tasty!